ELEVATION: 4326 Ft. / 4459 Ft.
From route 112 (Kancamagus Highway) look for the large Lincoln Woods parking area on the left. From Lincoln Woods parking area head to the left side of the ranger station and make a quick U-turn along the gravel walkway. Cross the suspension bridge and follow the Wilderness (Lincoln Woods) Trail. The Wilderness trail follows an old rail road grade and is long, flat and straight with railroad ties crossing it's center. At 1.4 Miles the Osseo trail junction is a welcoming sign. The Osseo Trail follows a winding brook and soon enters an old incline logging railroad grade. There is little evidence of the RR grade as you ascend the valley. At 2.1 miles the Osseo trail breaks from the stream and climbs by switchbacks to a col west of an indistinct 2780 foot bump then follows the ridgeline. At 3.2 miles you reach several wooden staircases and a outlook with fine views of Owls Head and the Bonds. After ascending the stairs to the top of the ridge the grade becomes easier until it males a 90 degree right turn and reaches Franconia Ridge at 3.7 miles. It's a short but steep 0.4 mile pitch to the Flume Slide Trail junction. The Osseo trail ends and becomes the Franconia Ridge Trail ascending you 0.1 miles over the western edge of an open cliff face to Mt. Flume and spectacular views. Continue North along the Franconia Ridge Trail as it descends to the col then climbs and increasingly steep grade to the open summit of Mt. Liberty at 1.2 miles. Mt. Flume and Mt. Liberty are the 2 southern peaks of Franconia ridge and offer spectacular views in all directions. At 4326 Ft. and 4459 Ft. they are both on the AMC 4000 footer list and extremely popular hikes. The at 13.6 miles the distance is a few miles longer than the traditional route ascending the Flume Slide trail however the Osseo Trail will provide seclusion from the more popular route. 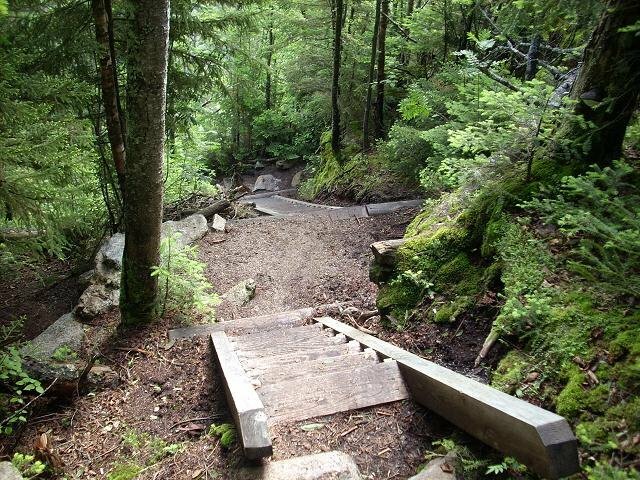 The stairs along the final pitch are well crafted and offer some excitement along the Osseo Trail. From the outlook at the base of the stairs you receive a spectacular view of Owls Head, the Bonds and Presidential range. The final pitch up the Franconia Ridge Trail ascends along the western edge of some precarious cliffs. Mt. Cannon and the Cannon Cliffs from the Mt. Flume summit.